GOV.UK celebrates its first birthday on Thursday. We’ll be writing about some of the most interesting data we’ve seen this year in the run-up. Visitors normally come to GOV.UK to get things done or find out information to help with their private or professional lives. Whilst on an upward trend, traffic patterns are fairly consistent from week to week. But when big national events take place, is there an impact on traffic? The Wimbledon Men’s Singles Final took place on 7 July and, for the first time in years, a Briton won the final. 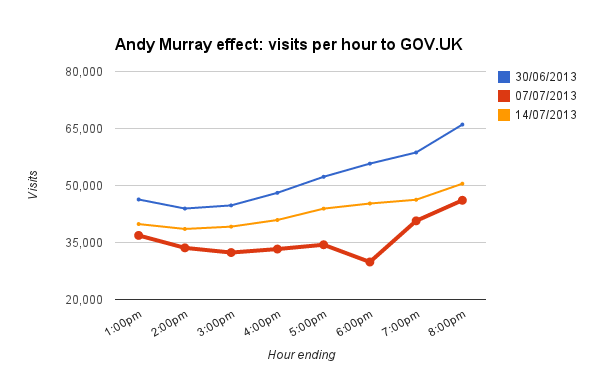 Over the five hours from 1:00pm to 6:00pm, visits were down 33% on the previous Sunday, with an even bigger fall in the last hour. 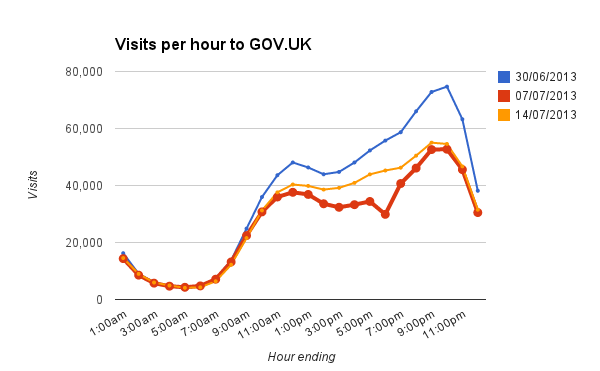 We also hypothesised that more people might have accessed GOV.UK by mobile or tablets on 7 July or that residents of Scotland might have been less inclined to visit GOV.UK, but that wasn’t the case. If you’d like to see the data, download this csv file. NOTE: We originally wrote that Murray's appearance was "the first time in years a Briton was in the final". Obviously we'd all blotted out his defeat in 2012. Cheers for the correction Jill! Good catch Jill - have updated that now. I think we'd all done our best to blot it out. i was thinking that when I wrote the post. mea culpa - we should always check the context! Now I never thought we would see an animated gif on GOV.UK! Love it! And even more surprising, it works on my government computer!